In Chapter 1 - Basics we took ZeroMQ for a drive, with some basic examples of the main ZeroMQ patterns: request-reply, pub-sub, and pipeline. In this chapter, we're going to get our hands dirty and start to learn how to use these tools in real programs. How to create and work with ZeroMQ sockets. How to send and receive messages on sockets. How to build your apps around ZeroMQ's asynchronous I/O model. How to handle multiple sockets in one thread. How to handle fatal and nonfatal errors properly. How to handle interrupt signals like Ctrl-C.
How to shut down a ZeroMQ application cleanly. How to check a ZeroMQ application for memory leaks. How to send and receive multipart messages. How to forward messages across networks. How to build a simple message queuing broker. How to write multithreaded applications with ZeroMQ. How to use ZeroMQ to signal between threads. How to use ZeroMQ to coordinate a network of nodes. How to create and use message envelopes for pub-sub. Using the HWM (high-water mark) to protect against memory overflows. To be perfectly honest, ZeroMQ does a kind of switch-and-bait on you, for which we don't apologize. It's for your own good and it hurts us more than it hurts you. ZeroMQ presents a familiar socket-based API, which requires great effort for us to hide a bunch of message-processing engines. However, the result will slowly fix your world view about how to design and write distributed software. Sockets are the de facto standard API for network programming, as well as being useful for stopping your eyes from falling onto your cheeks. One thing that makes ZeroMQ especially tasty to developers is that it uses sockets and messages instead of some other arbitrary set of concepts. Kudos to Martin Sustrik for pulling this off. It turns "Message Oriented Middleware", a phrase guaranteed to send the whole room off to Catatonia, into "Extra Spicy Sockets! ", which leaves us with a strange craving for pizza and a desire to know more. Creating and destroying sockets, which go together to form a karmic circle of socket life (see zmq_socket(), zmq_close()). Configuring sockets by setting options on them and checking them if necessary (see zmq_setsockopt(), zmq_getsockopt()). Plugging sockets into the network topology by creating ZeroMQ connections to and from them (see zmq_bind(), zmq_connect()). Using the sockets to carry data by writing and receiving messages on them (see zmq_msg_send(), zmq_msg_recv()). Note that sockets are always void pointers, and messages (which we'll come to very soon) are structures. So in C you pass sockets as-such, but you pass addresses of messages in all functions that work with messages, like zmq_msg_send() and zmq_msg_recv(). As a mnemonic, realize that "in ZeroMQ, all your sockets are belong to us", but messages are things you actually own in your code. Creating, destroying, and configuring sockets works as you'd expect for any object. But remember that ZeroMQ is an asynchronous, elastic fabric. This has some impact on how we plug sockets into the network topology and how we use the sockets after that. To create a connection between two nodes, you use zmq_bind() in one node and zmq_connect() in the other. As a general rule of thumb, the node that does zmq_bind() is a "server", sitting on a well-known network address, and the node which does zmq_connect() is a "client", with unknown or arbitrary network addresses. Thus we say that we "bind a socket to an endpoint" and "connect a socket to an endpoint", the endpoint being that well-known network address. They go across an arbitrary transport (inproc, ipc, tcp, pgm, or epgm). See zmq_inproc(), zmq_ipc(), zmq_tcp(), zmq_pgm(), and zmq_epgm(). One socket may have many outgoing and many incoming connections. There is no zmq_accept() method. When a socket is bound to an endpoint it automatically starts accepting connections. The network connection itself happens in the background, and ZeroMQ will automatically reconnect if the network connection is broken (e.g., if the peer disappears and then comes back). Your application code cannot work with these connections directly; they are encapsulated under the socket. Many architectures follow some kind of client/server model, where the server is the component that is most static, and the clients are the components that are most dynamic, i.e., they come and go the most. There are sometimes issues of addressing: servers will be visible to clients, but not necessarily vice versa. So mostly it's obvious which node should be doing zmq_bind() (the server) and which should be doing zmq_connect() (the client). It also depends on the kind of sockets you're using, with some exceptions for unusual network architectures. We'll look at socket types later. Now, imagine we start the client before we start the server. In traditional networking, we get a big red Fail flag. But ZeroMQ lets us start and stop pieces arbitrarily. As soon as the client node does zmq_connect(), the connection exists and that node can start to write messages to the socket. At some stage (hopefully before messages queue up so much that they start to get discarded, or the client blocks), the server comes alive, does a zmq_bind(), and ZeroMQ starts to deliver messages. With most transports, you cannot bind to the same endpoint twice, unlike for example in UDP. The ipc transport does, however, let one process bind to an endpoint already used by a first process. It's meant to allow a process to recover after a crash. Although ZeroMQ tries to be neutral about which side binds and which side connects, there are differences. We'll see these in more detail later. The upshot is that you should usually think in terms of "servers" as static parts of your topology that bind to more or less fixed endpoints, and "clients" as dynamic parts that come and go and connect to these endpoints. Then, design your application around this model. The chances that it will "just work" are much better like that. Sockets have types. The socket type defines the semantics of the socket, its policies for routing messages inwards and outwards, queuing, etc. You can connect certain types of socket together, e.g., a publisher socket and a subscriber socket. 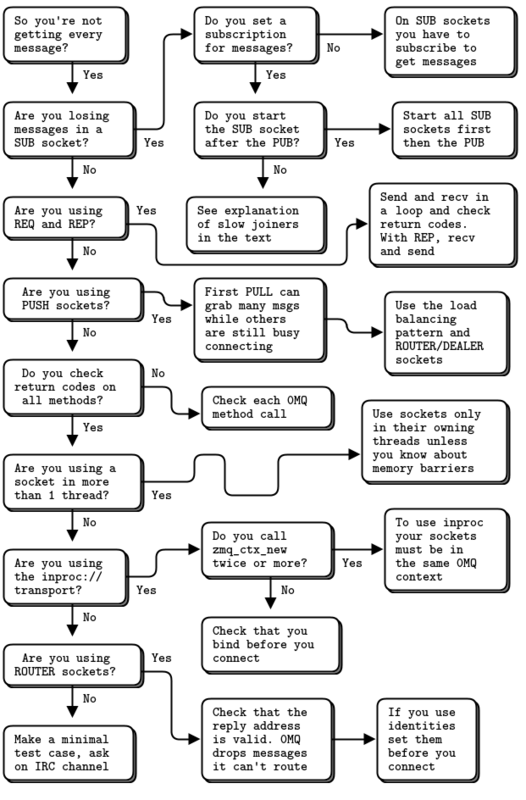 Sockets work together in "messaging patterns". We'll look at this in more detail later. It's the ability to connect sockets in these different ways that gives ZeroMQ its basic power as a message queuing system. There are layers on top of this, such as proxies, which we'll get to later. But essentially, with ZeroMQ you define your network architecture by plugging pieces together like a child's construction toy. To send and receive messages you use the zmq_msg_send() and zmq_msg_recv() methods. The names are conventional, but ZeroMQ's I/O model is different enough from the classic TCP model that you will need time to get your head around it. ZeroMQ sockets carry messages, like UDP, rather than a stream of bytes as TCP does. A ZeroMQ message is length-specified binary data. We'll come to messages shortly; their design is optimized for performance and so a little tricky. ZeroMQ sockets do their I/O in a background thread. This means that messages arrive in local input queues and are sent from local output queues, no matter what your application is busy doing. ZeroMQ sockets have one-to-N routing behavior built-in, according to the socket type. The zmq_send() method does not actually send the message to the socket connection(s). It queues the message so that the I/O thread can send it asynchronously. It does not block except in some exception cases. So the message is not necessarily sent when zmq_send() returns to your application. ZeroMQ provides a set of unicast transports (inproc, ipc, and tcp) and multicast transports (epgm, pgm). Multicast is an advanced technique that we'll come to later. Don't even start using it unless you know that your fan-out ratios will make 1-to-N unicast impossible. For most common cases, use tcp, which is a disconnected TCP transport. It is elastic, portable, and fast enough for most cases. We call this disconnected because ZeroMQ's tcp transport doesn't require that the endpoint exists before you connect to it. Clients and servers can connect and bind at any time, can go and come back, and it remains transparent to applications. The inter-process ipc transport is disconnected, like tcp. It has one limitation: it does not yet work on Windows. By convention we use endpoint names with an ".ipc" extension to avoid potential conflict with other file names. On UNIX systems, if you use ipc endpoints you need to create these with appropriate permissions otherwise they may not be shareable between processes running under different user IDs. You must also make sure all processes can access the files, e.g., by running in the same working directory. The inter-thread transport, inproc, is a connected signaling transport. It is much faster than tcp or ipc. This transport has a specific limitation compared to tcp and ipc: the server must issue a bind before any client issues a connect. This is something future versions of ZeroMQ may fix, but at present this defines how you use inproc sockets. We create and bind one socket and start the child threads, which create and connect the other sockets. A common question that newcomers to ZeroMQ ask (it's one I've asked myself) is, "how do I write an XYZ server in ZeroMQ?" For example, "how do I write an HTTP server in ZeroMQ?" The implication is that if we use normal sockets to carry HTTP requests and responses, we should be able to use ZeroMQ sockets to do the same, only much faster and better. The answer used to be "this is not how it works". ZeroMQ is not a neutral carrier: it imposes a framing on the transport protocols it uses. This framing is not compatible with existing protocols, which tend to use their own framing. For example, compare an HTTP request and a ZeroMQ request, both over TCP/IP. The HTTP request uses CR-LF as its simplest framing delimiter, whereas ZeroMQ uses a length-specified frame. So you could write an HTTP-like protocol using ZeroMQ, using for example the request-reply socket pattern. But it would not be HTTP. Since v3.3, however, ZeroMQ has a socket option called ZMQ_ROUTER_RAW that lets you read and write data without the ZeroMQ framing. You could use this to read and write proper HTTP requests and responses. Hardeep Singh contributed this change so that he could connect to Telnet servers from his ZeroMQ application. At time of writing this is still somewhat experimental, but it shows how ZeroMQ keeps evolving to solve new problems. Maybe the next patch will be yours. We've seen that one socket can handle dozens, even thousands of connections at once. This has a fundamental impact on how you write applications. A traditional networked application has one process or one thread per remote connection, and that process or thread handles one socket. ZeroMQ lets you collapse this entire structure into a single process and then break it up as necessary for scaling. If you are using ZeroMQ for inter-thread communications only (i.e., a multithreaded application that does no external socket I/O) you can set the I/O threads to zero. It's not a significant optimization though, more of a curiosity. Underneath the brown paper wrapping of ZeroMQ's socket API lies the world of messaging patterns. If you have a background in enterprise messaging, or know UDP well, these will be vaguely familiar. But to most ZeroMQ newcomers, they are a surprise. We're so used to the TCP paradigm where a socket maps one-to-one to another node. Let's recap briefly what ZeroMQ does for you. It delivers blobs of data (messages) to nodes, quickly and efficiently. You can map nodes to threads, processes, or nodes. ZeroMQ gives your applications a single socket API to work with, no matter what the actual transport (like in-process, inter-process, TCP, or multicast). It automatically reconnects to peers as they come and go. It queues messages at both sender and receiver, as needed. It limits these queues to guard processes against running out of memory. It handles socket errors. It does all I/O in background threads. It uses lock-free techniques for talking between nodes, so there are never locks, waits, semaphores, or deadlocks. But cutting through that, it routes and queues messages according to precise recipes called patterns. It is these patterns that provide ZeroMQ's intelligence. They encapsulate our hard-earned experience of the best ways to distribute data and work. ZeroMQ's patterns are hard-coded but future versions may allow user-definable patterns. ZeroMQ patterns are implemented by pairs of sockets with matching types. In other words, to understand ZeroMQ patterns you need to understand socket types and how they work together. Mostly, this just takes study; there is little that is obvious at this level. Request-reply, which connects a set of clients to a set of services. This is a remote procedure call and task distribution pattern. 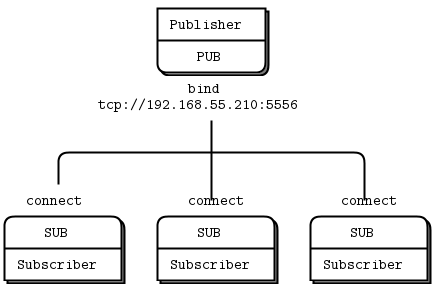 Pub-sub, which connects a set of publishers to a set of subscribers. This is a data distribution pattern. 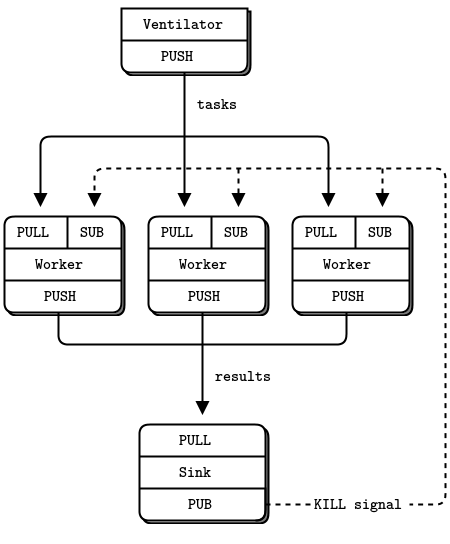 Pipeline, which connects nodes in a fan-out/fan-in pattern that can have multiple steps and loops. This is a parallel task distribution and collection pattern. Exclusive pair, which connects two sockets exclusively. This is a pattern for connecting two threads in a process, not to be confused with "normal" pairs of sockets. You'll also see references to XPUB and XSUB sockets, which we'll come to later (they're like raw versions of PUB and SUB). Any other combination will produce undocumented and unreliable results, and future versions of ZeroMQ will probably return errors if you try them. You can and will, of course, bridge other socket types via code, i.e., read from one socket type and write to another. These four core patterns are cooked into ZeroMQ. They are part of the ZeroMQ API, implemented in the core C++ library, and are guaranteed to be available in all fine retail stores. On top of those, we add high-level messaging patterns. We build these high-level patterns on top of ZeroMQ and implement them in whatever language we're using for our application. They are not part of the core library, do not come with the ZeroMQ package, and exist in their own space as part of the ZeroMQ community. For example the Majordomo pattern, which we explore in Chapter 4 - Reliable Request-Reply Patterns, sits in the GitHub Majordomo project in the ZeroMQ organization. 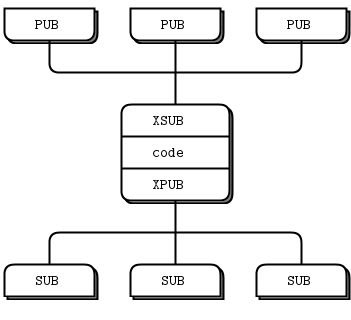 One of the things we aim to provide you with in this book are a set of such high-level patterns, both small (how to handle messages sanely) and large (how to make a reliable pub-sub architecture). Initialise a message: zmq_msg_init(), zmq_msg_init_size(), zmq_msg_init_data(). Sending and receiving a message: zmq_msg_send(), zmq_msg_recv(). Access message content: zmq_msg_data(), zmq_msg_size(), zmq_msg_more(). Work with message properties: zmq_msg_get(), zmq_msg_set(). On the wire, ZeroMQ messages are blobs of any size from zero upwards that fit in memory. You do your own serialization using protocol buffers, msgpack, JSON, or whatever else your applications need to speak. It's wise to choose a data representation that is portable, but you can make your own decisions about trade-offs. You create and pass around zmq_msg_t objects, not blocks of data. To read a message, you use zmq_msg_init() to create an empty message, and then you pass that to zmq_msg_recv(). To write a message from new data, you use zmq_msg_init_size() to create a message and at the same time allocate a block of data of some size. You then fill that data using memcpy, and pass the message to zmq_msg_send(). To release (not destroy) a message, you call zmq_msg_close(). This drops a reference, and eventually ZeroMQ will destroy the message. To access the message content, you use zmq_msg_data(). To know how much data the message contains, use zmq_msg_size(). Do not use zmq_msg_move(), zmq_msg_copy(), or zmq_msg_init_data() unless you read the man pages and know precisely why you need these. After you pass a message to zmq_msg_send(), ØMQ will clear the message, i.e., set the size to zero. You cannot send the same message twice, and you cannot access the message data after sending it. These rules don't apply if you use zmq_send() and zmq_recv(), to which you pass byte arrays, not message structures. If you want to send the same message more than once, and it's sizable, create a second message, initialize it using zmq_msg_init(), and then use zmq_msg_copy() to create a copy of the first message. This does not copy the data but copies a reference. You can then send the message twice (or more, if you create more copies) and the message will only be finally destroyed when the last copy is sent or closed. ZeroMQ also supports multipart messages, which let you send or receive a list of frames as a single on-the-wire message. This is widely used in real applications and we'll look at that later in this chapter and in Chapter 3 - Advanced Request-Reply Patterns. Frames (also called "message parts" in the ZeroMQ reference manual pages) are the basic wire format for ZeroMQ messages. A frame is a length-specified block of data. The length can be zero upwards. If you've done any TCP programming you'll appreciate why frames are a useful answer to the question "how much data am I supposed to read of this network socket now?" There is a wire-level protocol called ZMTP that defines how ZeroMQ reads and writes frames on a TCP connection. If you're interested in how this works, the spec is quite short. Originally, a ZeroMQ message was one frame, like UDP. We later extended this with multipart messages, which are quite simply series of frames with a "more" bit set to one, followed by one with that bit set to zero. The ZeroMQ API then lets you write messages with a "more" flag and when you read messages, it lets you check if there's "more". A message can be one or more parts. These parts are also called "frames". Each part is a zmq_msg_t object. You send and receive each part separately, in the low-level API. Higher-level APIs provide wrappers to send entire multipart messages. You may send zero-length messages, e.g., for sending a signal from one thread to another. ZeroMQ guarantees to deliver all the parts (one or more) for a message, or none of them. ZeroMQ does not send the message (single or multipart) right away, but at some indeterminate later time. A multipart message must therefore fit in memory. A message (single or multipart) must fit in memory. If you want to send files of arbitrary sizes, you should break them into pieces and send each piece as separate single-part messages. Using multipart data will not reduce memory consumption. You must call zmq_msg_close() when finished with a received message, in languages that don't automatically destroy objects when a scope closes. You don't call this method after sending a message. And to be repetitive, do not use zmq_msg_init_data() yet. This is a zero-copy method and is guaranteed to create trouble for you. There are far more important things to learn about ZeroMQ before you start to worry about shaving off microseconds. This rich API can be tiresome to work with. The methods are optimized for performance, not simplicity. If you start using these you will almost definitely get them wrong until you've read the man pages with some care. So one of the main jobs of a good language binding is to wrap this API up in classes that are easier to use. Wait for message on socket. What if we want to read from multiple endpoints at the same time? The simplest way is to connect one socket to all the endpoints and get ZeroMQ to do the fan-in for us. This is legal if the remote endpoints are in the same pattern, but it would be wrong to connect a PULL socket to a PUB endpoint. To actually read from multiple sockets all at once, use zmq_poll(). An even better way might be to wrap zmq_poll() in a framework that turns it into a nice event-driven reactor, but it's significantly more work than we want to cover here. The cost of this approach is some additional latency on the first message (the sleep at the end of the loop, when there are no waiting messages to process). This would be a problem in applications where submillisecond latency was vital. Also, you need to check the documentation for nanosleep() or whatever function you use to make sure it does not busy-loop. You can treat the sockets fairly by reading first from one, then the second rather than prioritizing them as we did in this example. ZeroMQ lets us compose a message out of several frames, giving us a "multipart message". Realistic applications use multipart messages heavily, both for wrapping messages with address information and for simple serialization. We'll look at reply envelopes later. What we'll learn now is simply how to blindly and safely read and write multipart messages in any application (such as a proxy) that needs to forward messages without inspecting them. When you work with multipart messages, each part is a zmq_msg item. E.g., if you are sending a message with five parts, you must construct, send, and destroy five zmq_msg items. You can do this in advance (and store the zmq_msg items in an array or other structure), or as you send them, one-by-one. When you send a multipart message, the first part (and all following parts) are only actually sent on the wire when you send the final part. If you are using zmq_poll(), when you receive the first part of a message, all the rest has also arrived. You will receive all parts of a message, or none at all. Each part of a message is a separate zmq_msg item. You will receive all parts of a message whether or not you check the more property. On sending, ZeroMQ queues message frames in memory until the last is received, then sends them all. There is no way to cancel a partially sent message, except by closing the socket. ZeroMQ aims for decentralized intelligence, but that doesn't mean your network is empty space in the middle. It's filled with message-aware infrastructure and quite often, we build that infrastructure with ZeroMQ. The ZeroMQ plumbing can range from tiny pipes to full-blown service-oriented brokers. The messaging industry calls this intermediation, meaning that the stuff in the middle deals with either side. 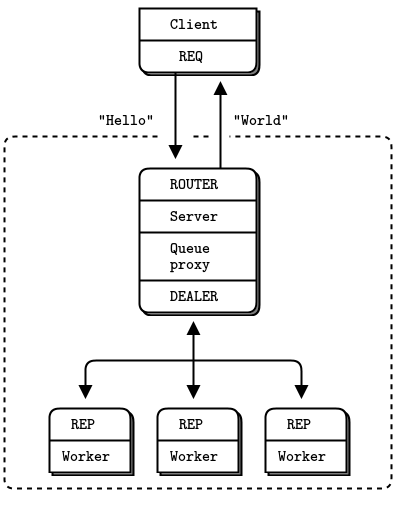 In ZeroMQ, we call these proxies, queues, forwarders, device, or brokers, depending on the context. This pattern is extremely common in the real world and is why our societies and economies are filled with intermediaries who have no other real function than to reduce the complexity and scaling costs of larger networks. Real-world intermediaries are typically called wholesalers, distributors, managers, and so on. We need XPUB and XSUB sockets because ZeroMQ does subscription forwarding from subscribers to publishers. XSUB and XPUB are exactly like SUB and PUB except they expose subscriptions as special messages. The proxy has to forward these subscription messages from subscriber side to publisher side, by reading them from the XPUB socket and writing them to the XSUB socket. This is the main use case for XSUB and XPUB. In the Hello World client/server application, we have one client that talks to one service. However, in real cases we usually need to allow multiple services as well as multiple clients. This lets us scale up the power of the service (many threads or processes or nodes rather than just one). The only constraint is that services must be stateless, all state being in the request or in some shared storage such as a database. There are two ways to connect multiple clients to multiple servers. The brute force way is to connect each client socket to multiple service endpoints. One client socket can connect to multiple service sockets, and the REQ socket will then distribute requests among these services. Let's say you connect a client socket to three service endpoints; A, B, and C. The client makes requests R1, R2, R3, R4. R1 and R4 go to service A, R2 goes to B, and R3 goes to service C.
This design lets you add more clients cheaply. You can also add more services. Each client will distribute its requests to the services. But each client has to know the service topology. If you have 100 clients and then you decide to add three more services, you need to reconfigure and restart 100 clients in order for the clients to know about the three new services. That's clearly not the kind of thing we want to be doing at 3 a.m. when our supercomputing cluster has run out of resources and we desperately need to add a couple of hundred of new service nodes. Too many static pieces are like liquid concrete: knowledge is distributed and the more static pieces you have, the more effort it is to change the topology. What we want is something sitting in between clients and services that centralizes all knowledge of the topology. Ideally, we should be able to add and remove services or clients at any time without touching any other part of the topology. So we'll write a little message queuing broker that gives us this flexibility. 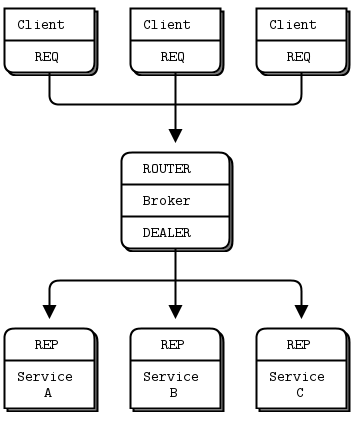 The broker binds to two endpoints, a frontend for clients and a backend for services. It then uses zmq_poll() to monitor these two sockets for activity and when it has some, it shuttles messages between its two sockets. It doesn't actually manage any queues explicitly—ZeroMQ does that automatically on each socket. When you use REQ to talk to REP, you get a strictly synchronous request-reply dialog. The client sends a request. The service reads the request and sends a reply. The client then reads the reply. If either the client or the service try to do anything else (e.g., sending two requests in a row without waiting for a response), they will get an error. But our broker has to be nonblocking. Obviously, we can use zmq_poll() to wait for activity on either socket, but we can't use REP and REQ. Luckily, there are two sockets called DEALER and ROUTER that let you do nonblocking request-response. You'll see in Chapter 3 - Advanced Request-Reply Patterns how DEALER and ROUTER sockets let you build all kinds of asynchronous request-reply flows. For now, we're just going to see how DEALER and ROUTER let us extend REQ-REP across an intermediary, that is, our little broker. In this simple extended request-reply pattern, REQ talks to ROUTER and DEALER talks to REP. In between the DEALER and ROUTER, we have to have code (like our broker) that pulls messages off the one socket and shoves them onto the other. 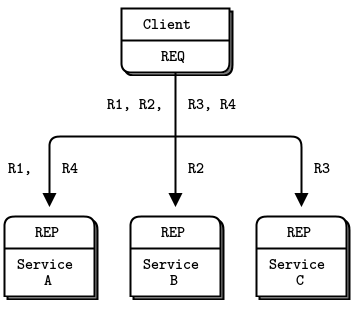 Using a request-reply broker makes your client/server architectures easier to scale because clients don't see workers, and workers don't see clients. The only static node is the broker in the middle. If you're like most ZeroMQ users, at this stage your mind is starting to think, "What kind of evil stuff can I do if I plug random socket types into the proxy?" The short answer is: try it and work out what is happening. In practice, you would usually stick to ROUTER/DEALER, XSUB/XPUB, or PULL/PUSH. A frequent request from ZeroMQ users is, "How do I connect my ZeroMQ network with technology X?" where X is some other networking or messaging technology. The simple answer is to build a bridge. A bridge is a small application that speaks one protocol at one socket, and converts to/from a second protocol at another socket. A protocol interpreter, if you like. A common bridging problem in ZeroMQ is to bridge two transports or networks. As an example, we're going to write a little proxy that sits in between a publisher and a set of subscribers, bridging two networks. 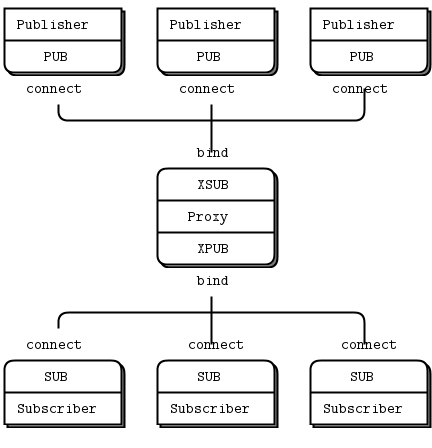 The frontend socket (SUB) faces the internal network where the weather server is sitting, and the backend (PUB) faces subscribers on the external network. It subscribes to the weather service on the frontend socket, and republishes its data on the backend socket. It looks very similar to the earlier proxy example, but the key part is that the frontend and backend sockets are on two different networks. 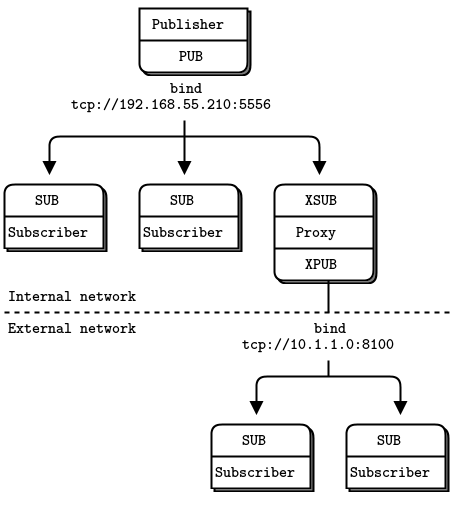 We can use this model for example to connect a multicast network (pgm transport) to a tcp publisher. ZeroMQ's error handling philosophy is a mix of fail-fast and resilience. Processes, we believe, should be as vulnerable as possible to internal errors, and as robust as possible against external attacks and errors. To give an analogy, a living cell will self-destruct if it detects a single internal error, yet it will resist attack from the outside by all means possible. Assertions, which pepper the ZeroMQ code, are absolutely vital to robust code; they just have to be on the right side of the cellular wall. And there should be such a wall. If it is unclear whether a fault is internal or external, that is a design flaw to be fixed. In C/C++, assertions stop the application immediately with an error. In other languages, you may get exceptions or halts. When ZeroMQ detects an external fault it returns an error to the calling code. In some rare cases, it drops messages silently if there is no obvious strategy for recovering from the error. Methods that create objects return NULL if they fail. Methods that process data may return the number of bytes processed, or -1 on an error or failure. Other methods return 0 on success and -1 on an error or failure. The error code is provided in errno or zmq_errno(). A descriptive error text for logging is provided by zmq_strerror(). When your code receives a message with the ZMQ_DONTWAIT option and there is no waiting data, ZeroMQ will return -1 and set errno to EAGAIN. When one thread calls zmq_ctx_destroy(), and other threads are still doing blocking work, the zmq_ctx_destroy() call closes the context and all blocking calls exit with -1, and errno set to ETERM. In C/C++, asserts can be removed entirely in optimized code, so don't make the mistake of wrapping the whole ZeroMQ call in an assert(). It looks neat; then the optimizer removes all the asserts and the calls you want to make, and your application breaks in impressive ways. Let's see how to shut down a process cleanly. We'll take the parallel pipeline example from the previous section. If we've started a whole lot of workers in the background, we now want to kill them when the batch is finished. Let's do this by sending a kill message to the workers. The best place to do this is the sink because it really knows when the batch is done. The sink creates a PUB socket on a new endpoint. Workers connect their input socket to this endpoint. When the sink detects the end of the batch, it sends a kill to its PUB socket. When a worker detects this kill message, it exits. Realistic applications need to shut down cleanly when interrupted with Ctrl-C or another signal such as SIGTERM. By default, these simply kill the process, meaning messages won't be flushed, files won't be closed cleanly, and so on. If your code is blocking in a blocking call (sending a message, receiving a message, or polling), then when a signal arrives, the call will return with EINTR. Wrappers like s_recv() return NULL if they are interrupted. So check for an EINTR return code, a NULL return, and/or s_interrupted. If you call s_catch_signals() and don't test for interrupts, then your application will become immune to Ctrl-C and SIGTERM, which may be useful, but is usually not. Any long-running application has to manage memory correctly, or eventually it'll use up all available memory and crash. If you use a language that handles this automatically for you, congratulations. If you program in C or C++ or any other language where you're responsible for memory management, here's a short tutorial on using valgrind, which among other things will report on any leaks your programs have. Fix your applications to exit cleanly after Ctrl-C. For any application that exits by itself, that's not needed, but for long-running applications, this is essential, otherwise valgrind will complain about all currently allocated memory. Build your application with -DDEBUG if it's not your default setting. That ensures valgrind can tell you exactly where memory is being leaked. ZeroMQ is perhaps the nicest way ever to write multithreaded (MT) applications. Whereas ZeroMQ sockets require some readjustment if you are used to traditional sockets, ZeroMQ multithreading will take everything you know about writing MT applications, throw it into a heap in the garden, pour gasoline over it, and set it alight. It's a rare book that deserves burning, but most books on concurrent programming do. To make utterly perfect MT programs (and I mean that literally), we don't need mutexes, locks, or any other form of inter-thread communication except messages sent across ZeroMQ sockets. By "perfect MT programs", I mean code that's easy to write and understand, that works with the same design approach in any programming language, and on any operating system, and that scales across any number of CPUs with zero wait states and no point of diminishing returns. If you've spent years learning tricks to make your MT code work at all, let alone rapidly, with locks and semaphores and critical sections, you will be disgusted when you realize it was all for nothing. If there's one lesson we've learned from 30+ years of concurrent programming, it is: just don't share state. It's like two drunkards trying to share a beer. It doesn't matter if they're good buddies. Sooner or later, they're going to get into a fight. And the more drunkards you add to the table, the more they fight each other over the beer. The tragic majority of MT applications look like drunken bar fights. The list of weird problems that you need to fight as you write classic shared-state MT code would be hilarious if it didn't translate directly into stress and risk, as code that seems to work suddenly fails under pressure. A large firm with world-beating experience in buggy code released its list of "11 Likely Problems In Your Multithreaded Code", which covers forgotten synchronization, incorrect granularity, read and write tearing, lock-free reordering, lock convoys, two-step dance, and priority inversion. Yeah, we counted seven problems, not eleven. That's not the point though. The point is, do you really want that code running the power grid or stock market to start getting two-step lock convoys at 3 p.m. on a busy Thursday? Who cares what the terms actually mean? This is not what turned us on to programming, fighting ever more complex side effects with ever more complex hacks. Some widely used models, despite being the basis for entire industries, are fundamentally broken, and shared state concurrency is one of them. Code that wants to scale without limit does it like the Internet does, by sending messages and sharing nothing except a common contempt for broken programming models. Isolate data privately within its thread and never share data in multiple threads. The only exception to this are ZeroMQ contexts, which are threadsafe. Stay away from the classic concurrency mechanisms like as mutexes, critical sections, semaphores, etc. These are an anti-pattern in ZeroMQ applications. Create one ZeroMQ context at the start of your process, and pass that to all threads that you want to connect via inproc sockets. Use attached threads to create structure within your application, and connect these to their parent threads using PAIR sockets over inproc. The pattern is: bind parent socket, then create child thread which connects its socket. Use detached threads to simulate independent tasks, with their own contexts. Connect these over tcp. Later you can move these to stand-alone processes without changing the code significantly. All interaction between threads happens as ZeroMQ messages, which you can define more or less formally. Don't share ZeroMQ sockets between threads. ZeroMQ sockets are not threadsafe. Technically it's possible to migrate a socket from one thread to another but it demands skill. The only place where it's remotely sane to share sockets between threads are in language bindings that need to do magic like garbage collection on sockets. If you need to start more than one proxy in an application, for example, you will want to run each in their own thread. It is easy to make the error of creating the proxy frontend and backend sockets in one thread, and then passing the sockets to the proxy in another thread. This may appear to work at first but will fail randomly in real use. Remember: Do not use or close sockets except in the thread that created them. If you follow these rules, you can quite easily build elegant multithreaded applications, and later split off threads into separate processes as you need to. Application logic can sit in threads, processes, or nodes: whatever your scale needs. ZeroMQ uses native OS threads rather than virtual "green" threads. The advantage is that you don't need to learn any new threading API, and that ZeroMQ threads map cleanly to your operating system. You can use standard tools like Intel's ThreadChecker to see what your application is doing. The disadvantages are that native threading APIs are not always portable, and that if you have a huge number of threads (in the thousands), some operating systems will get stressed. Let's see how this works in practice. We'll turn our old Hello World server into something more capable. The original server ran in a single thread. If the work per request is low, that's fine: one ØMQ thread can run at full speed on a CPU core, with no waits, doing an awful lot of work. But realistic servers have to do nontrivial work per request. A single core may not be enough when 10,000 clients hit the server all at once. So a realistic server will start multiple worker threads. It then accepts requests as fast as it can and distributes these to its worker threads. The worker threads grind through the work and eventually send their replies back. You can, of course, do all this using a proxy broker and external worker processes, but often it's easier to start one process that gobbles up sixteen cores than sixteen processes, each gobbling up one core. Further, running workers as threads will cut out a network hop, latency, and network traffic. The server starts a set of worker threads. Each worker thread creates a REP socket and then processes requests on this socket. Worker threads are just like single-threaded servers. The only differences are the transport (inproc instead of tcp), and the bind-connect direction. The server creates a ROUTER socket to talk to clients and binds this to its external interface (over tcp). The server creates a DEALER socket to talk to the workers and binds this to its internal interface (over inproc). The server starts a proxy that connects the two sockets. The proxy pulls incoming requests fairly from all clients, and distributes those out to workers. It also routes replies back to their origin. Note that creating threads is not portable in most programming languages. The POSIX library is pthreads, but on Windows you have to use a different API. In our example, the pthread_create call starts up a new thread running the worker_routine function we defined. We'll see in Chapter 3 - Advanced Request-Reply Patterns how to wrap this in a portable API. Here the "work" is just a one-second pause. We could do anything in the workers, including talking to other nodes. This is what the MT server looks like in terms of ØMQ sockets and nodes. Note how the request-reply chain is REQ-ROUTER-queue-DEALER-REP. When you start making multithreaded applications with ZeroMQ, you'll encounter the question of how to coordinate your threads. Though you might be tempted to insert "sleep" statements, or use multithreading techniques such as semaphores or mutexes, the only mechanism that you should use are ZeroMQ messages. Remember the story of The Drunkards and The Beer Bottle. Two threads communicate over inproc, using a shared context. The parent thread creates one socket, binds it to an inproc:// endpoint, and then starts the child thread, passing the context to it. The child thread creates the second socket, connects it to that inproc:// endpoint, and then signals to the parent thread that it's ready. Note that multithreading code using this pattern is not scalable out to processes. If you use inproc and socket pairs, you are building a tightly-bound application, i.e., one where your threads are structurally interdependent. Do this when low latency is really vital. The other design pattern is a loosely bound application, where threads have their own context and communicate over ipc or tcp. You can easily break loosely bound threads into separate processes. You can use PUSH for the sender and PULL for the receiver. This looks simple and will work, but remember that PUSH will distribute messages to all available receivers. If you by accident start two receivers (e.g., you already have one running and you start a second), you'll "lose" half of your signals. PAIR has the advantage of refusing more than one connection; the pair is exclusive. You can use DEALER for the sender and ROUTER for the receiver. ROUTER, however, wraps your message in an "envelope", meaning your zero-size signal turns into a multipart message. If you don't care about the data and treat anything as a valid signal, and if you don't read more than once from the socket, that won't matter. If, however, you decide to send real data, you will suddenly find ROUTER providing you with "wrong" messages. DEALER also distributes outgoing messages, giving the same risk as PUSH. You can use PUB for the sender and SUB for the receiver. This will correctly deliver your messages exactly as you sent them and PUB does not distribute as PUSH or DEALER do. However, you need to configure the subscriber with an empty subscription, which is annoying. For these reasons, PAIR makes the best choice for coordination between pairs of threads. When you want to coordinate a set of nodes on a network, PAIR sockets won't work well any more. This is one of the few areas where the strategies for threads and nodes are different. Principally, nodes come and go whereas threads are usually static. PAIR sockets do not automatically reconnect if the remote node goes away and comes back. The second significant difference between threads and nodes is that you typically have a fixed number of threads but a more variable number of nodes. Let's take one of our earlier scenarios (the weather server and clients) and use node coordination to ensure that subscribers don't lose data when starting up. The publisher knows in advance how many subscribers it expects. This is just a magic number it gets from somewhere. The publisher starts up and waits for all subscribers to connect. This is the node coordination part. Each subscriber subscribes and then tells the publisher it's ready via another socket. When the publisher has all subscribers connected, it starts to publish data. We can't assume that the SUB connect will be finished by the time the REQ/REP dialog is complete. There are no guarantees that outbound connects will finish in any order whatsoever, if you're using any transport except inproc. So, the example does a brute force sleep of one second between subscribing, and sending the REQ/REP synchronization. Publisher opens PUB socket and starts sending "Hello" messages (not data). Subscribers connect SUB socket and when they receive a Hello message they tell the publisher via a REQ/REP socket pair. When the publisher has had all the necessary confirmations, it starts to send real data. ZeroMQ's message API lets you send and receive messages directly from and to application buffers without copying data. We call this zero-copy, and it can improve performance in some applications. You should think about using zero-copy in the specific case where you are sending large blocks of memory (thousands of bytes), at a high frequency. For short messages, or for lower message rates, using zero-copy will make your code messier and more complex with no measurable benefit. Like all optimizations, use this when you know it helps, and measure before and after. Note that you don't call zmq_msg_close() after sending a message—libzmq will do this automatically when it's actually done sending the message. There is no way to do zero-copy on receive: ZeroMQ delivers you a buffer that you can store as long as you wish, but it will not write data directly into application buffers. On writing, ZeroMQ's multipart messages work nicely together with zero-copy. In traditional messaging, you need to marshal different buffers together into one buffer that you can send. That means copying data. With ZeroMQ, you can send multiple buffers coming from different sources as individual message frames. Send each field as a length-delimited frame. To the application, it looks like a series of send and receive calls. But internally, the multiple parts get written to the network and read back with single system calls, so it's very efficient. In the pub-sub pattern, we can split the key into a separate message frame that we call an envelope. If you want to use pub-sub envelopes, make them yourself. It's optional, and in previous pub-sub examples we didn't do this. Using a pub-sub envelope is a little more work for simple cases, but it's cleaner especially for real cases, where the key and the data are naturally separate things. Subscriptions do a prefix match. That is, they look for "all messages starting with XYZ". The obvious question is: how to delimit keys from data so that the prefix match doesn't accidentally match data. The best answer is to use an envelope because the match won't cross a frame boundary. Here is a minimalist example of how pub-sub envelopes look in code. This publisher sends messages of two types, A and B. This example shows that the subscription filter rejects or accepts the entire multipart message (key plus data). You won't get part of a multipart message, ever. If you subscribe to multiple publishers and you want to know their address so that you can send them data via another socket (and this is a typical use case), create a three-part message. When you can send messages rapidly from process to process, you soon discover that memory is a precious resource, and one that can be trivially filled up. A few seconds of delay somewhere in a process can turn into a backlog that blows up a server unless you understand the problem and take precautions. The problem is this: imagine you have process A sending messages at high frequency to process B, which is processing them. Suddenly B gets very busy (garbage collection, CPU overload, whatever), and can't process the messages for a short period. It could be a few seconds for some heavy garbage collection, or it could be much longer, if there's a more serious problem. What happens to the messages that process A is still trying to send frantically? Some will sit in B's network buffers. Some will sit on the Ethernet wire itself. Some will sit in A's network buffers. And the rest will accumulate in A's memory, as rapidly as the application behind A sends them. If you don't take some precaution, A can easily run out of memory and crash. It is a consistent, classic problem with message brokers. What makes it hurt more is that it's B's fault, superficially, and B is typically a user-written application which A has no control over. What are the answers? One is to pass the problem upstream. A is getting the messages from somewhere else. So tell that process, "Stop!" And so on. This is called flow control. It sounds plausible, but what if you're sending out a Twitter feed? Do you tell the whole world to stop tweeting while B gets its act together? Flow control works in some cases, but not in others. The transport layer can't tell the application layer to "stop" any more than a subway system can tell a large business, "please keep your staff at work for another half an hour. I'm too busy". The answer for messaging is to set limits on the size of buffers, and then when we reach those limits, to take some sensible action. In some cases (not for a subway system, though), the answer is to throw away messages. In others, the best strategy is to wait. ZeroMQ uses the concept of HWM (high-water mark) to define the capacity of its internal pipes. Each connection out of a socket or into a socket has its own pipe, and HWM for sending, and/or receiving, depending on the socket type. Some sockets (PUB, PUSH) only have send buffers. Some (SUB, PULL, REQ, REP) only have receive buffers. 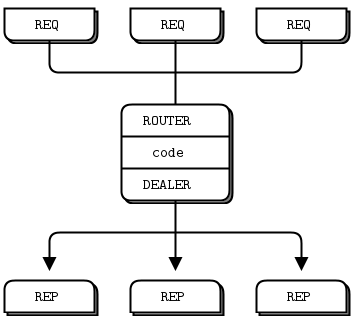 Some (DEALER, ROUTER, PAIR) have both send and receive buffers. In ZeroMQ v2.x, the HWM was infinite by default. This was easy but also typically fatal for high-volume publishers. In ZeroMQ v3.x, it's set to 1,000 by default, which is more sensible. If you're still using ZeroMQ v2.x, you should always set a HWM on your sockets, be it 1,000 to match ZeroMQ v3.x or another figure that takes into account your message sizes and expected subscriber performance. When your socket reaches its HWM, it will either block or drop data depending on the socket type. PUB and ROUTER sockets will drop data if they reach their HWM, while other socket types will block. Over the inproc transport, the sender and receiver share the same buffers, so the real HWM is the sum of the HWM set by both sides. Lastly, the HWMs are not exact; while you may get up to 1,000 messages by default, the real buffer size may be much lower (as little as half), due to the way libzmq implements its queues. As you build applications with ZeroMQ, you will come across this problem more than once: losing messages that you expect to receive. We have put together a diagram that walks through the most common causes for this. On SUB sockets, set a subscription using zmq_setsockopt() with ZMQ_SUBSCRIBE, or you won't get messages. Because you subscribe to messages by prefix, if you subscribe to "" (an empty subscription), you will get everything. If you start the SUB socket (i.e., establish a connection to a PUB socket) after the PUB socket has started sending out data, you will lose whatever it published before the connection was made. If this is a problem, set up your architecture so the SUB socket starts first, then the PUB socket starts publishing. Even if you synchronize a SUB and PUB socket, you may still lose messages. It's due to the fact that internal queues aren't created until a connection is actually created. If you can switch the bind/connect direction so the SUB socket binds, and the PUB socket connects, you may find it works more as you'd expect. If you're using REP and REQ sockets, and you're not sticking to the synchronous send/recv/send/recv order, ZeroMQ will report errors, which you might ignore. Then, it would look like you're losing messages. If you use REQ or REP, stick to the send/recv order, and always, in real code, check for errors on ZeroMQ calls. If you're using PUSH sockets, you'll find that the first PULL socket to connect will grab an unfair share of messages. The accurate rotation of messages only happens when all PULL sockets are successfully connected, which can take some milliseconds. As an alternative to PUSH/PULL, for lower data rates, consider using ROUTER/DEALER and the load balancing pattern. If you're sharing sockets across threads, don't. It will lead to random weirdness, and crashes. If you're using inproc, make sure both sockets are in the same context. Otherwise the connecting side will in fact fail. Also, bind first, then connect. inproc is not a disconnected transport like tcp. If you're using ROUTER sockets, it's remarkably easy to lose messages by accident, by sending malformed identity frames (or forgetting to send an identity frame). In general setting the ZMQ_ROUTER_MANDATORY option on ROUTER sockets is a good idea, but do also check the return code on every send call. Lastly, if you really can't figure out what's going wrong, make a minimal test case that reproduces the problem, and ask for help from the ZeroMQ community.